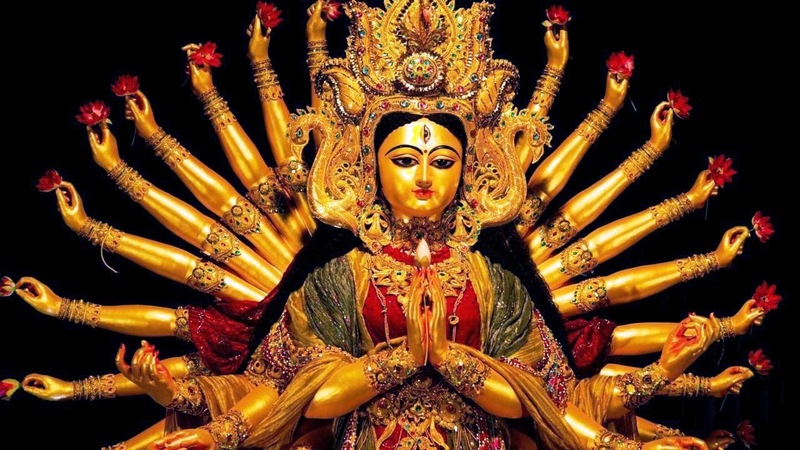 Indian Beauty Blog | Fashion | Lifestyle | Makeup | SparkleWithSurabhi : Durga Pujo and The Evolution of becoming a Benjabi. 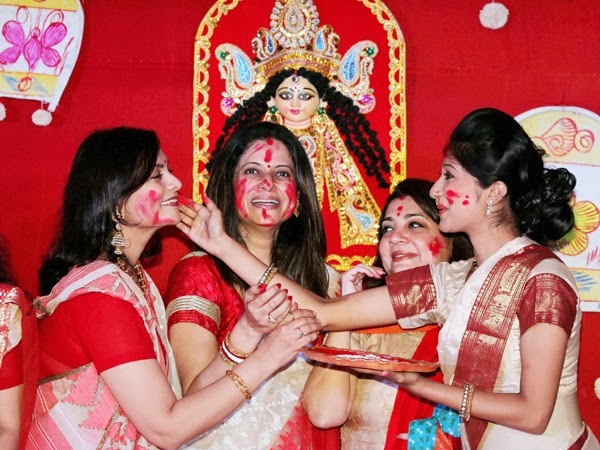 Durga Pujo and The Evolution of becoming a Benjabi. 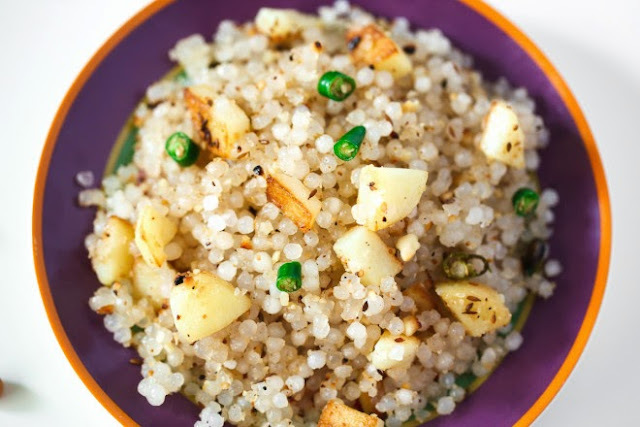 "Mata ko bhog lagana" first feed the goddesses and then animals and birds in your area and only then have the thali yourself which is Shudh Shakarahi/Pure Veg. 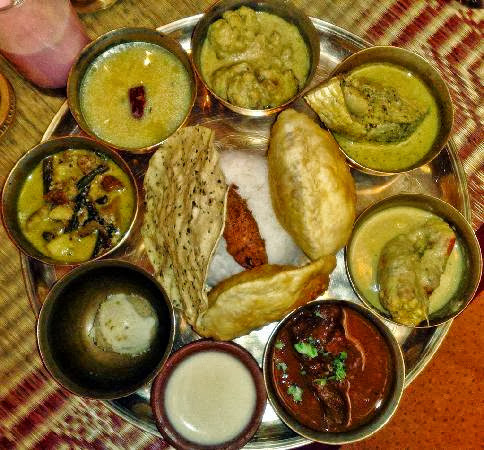 This was the thali I eagerly used wait for every year and after navratra's were over came the festival season Diwali till the new year. 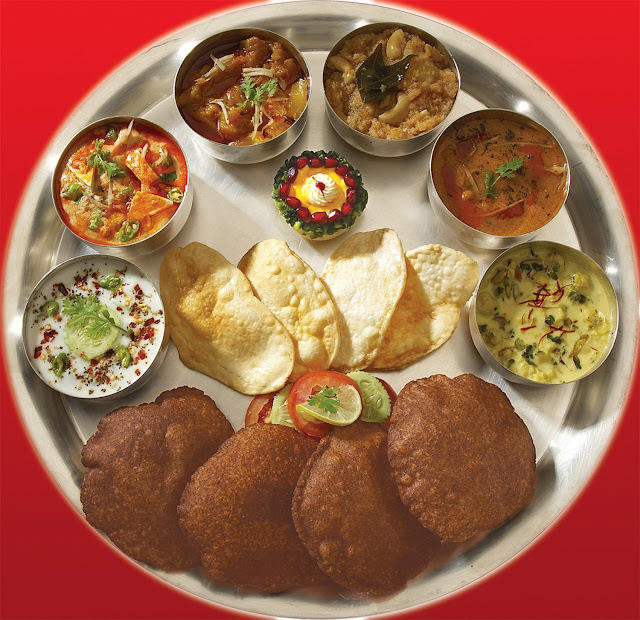 A typical Navratra Thali has Kutto Ki Atte ki Puri, Allo Jeera, Curd, Seetha Phal, Subutdana Kheer - Chawal - kichdi or Papad. However my perception of Navratra's changed completely when my father got posted to Calcutta/Kolkatta, West Bengal in the year 2007. 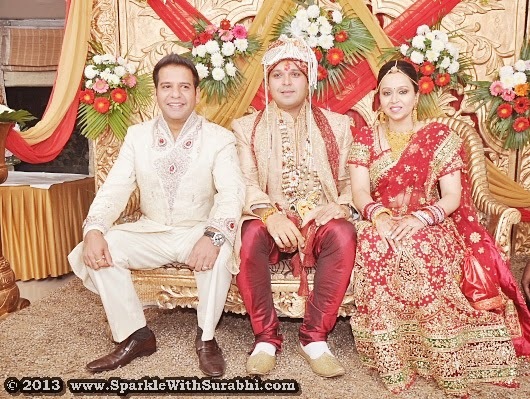 We stayed there on Belvedere Rd Apartments, Alipur for 4 years till I got married and shifted back to Delhi in 2010. Navratra's in Kolkatta are known as Durga Pujo or Durga Puja it is actually a festival season for all Bengali's as they believe that goddess Durga has come back to visit her mother land for 9 days and then she leaves back for her in laws place so Visarjaan or The Idol of Goddess is submerged in the Holy Ganga River near Babu Ghat - Howrah Bridge after 9 days as to signify that she has left. They also believe that Durga Puja signifies the victory of good over evil and Durga maa had slayed a demon called Mahishasur after a week long war and that is why they celebrate. 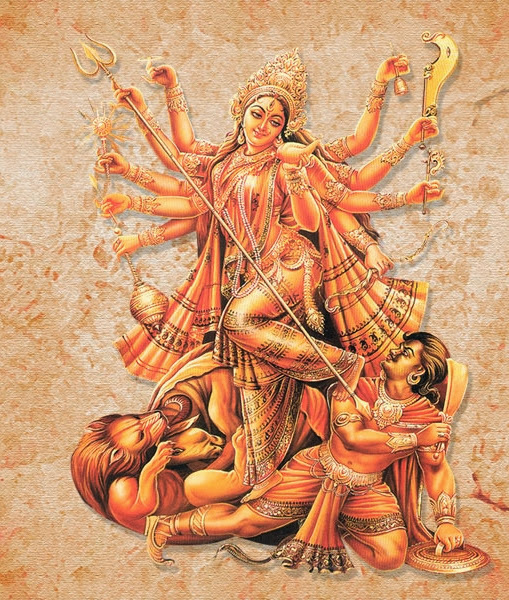 Durga Ma while slaying Mahishasur. 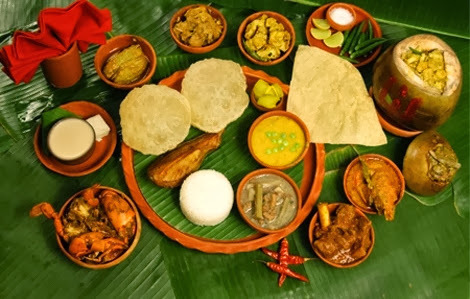 The Durga Puja's in Kolkata are a total opposite of what we celebrate it in northern India as you can eat whatever you like there is no such thing as fasting or shudh shakahari/ pure veg food. Bengalis are busy eating Khosha Meat, Tandoori Chicken, Fried Prawns and Mughlai Parathas !! ..Holy Cow.. many of them even enjoying having beaf and pork which is a strict NO in northern India.. It is total culture shock for us North Indians.. It was a serious culture shock for her to see meat hanging in the shacks right where Goddess Kali's Idol is kept. Here in Northern India it will beconsidered inauspicious to keep or have a meat shop right next to temple or even a sin! !..The Theory of Bengali's about Durga Puja is that it is a festival for them and not a fasting season. They Pray to the Goddess Kali and all the different roop of Durga Maa. 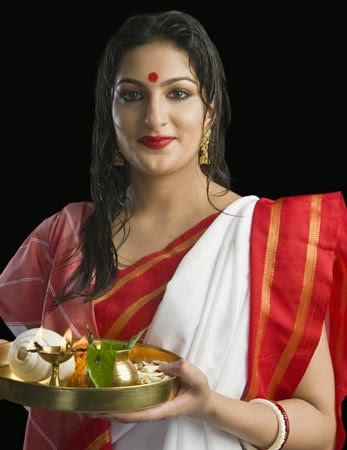 Since Kali Maa demands sacrifice or bali of an animal such as goat or fish - Meat and Drinks are offered to her as prasadam (PETA is so not going to like this but this Bengali tradition). They eat, drink and Be Merry ..It's Christmas for them...I met a bengali aunty who lived there all her life in Alipur and she said since Kali Maa comes to visit us every year in this season they enjoy and eat meat and do not believe in fasting like north indian's!! There is an old Bengali saying "Mach Bhaat Daroon Khabo!!" (Have fish - rice and have fun!!). That's India for you unity in diversity!! at one state in India its a taboo for the other its a boon .. different states and a totally different culture. Our country should be actually called the United States of India. 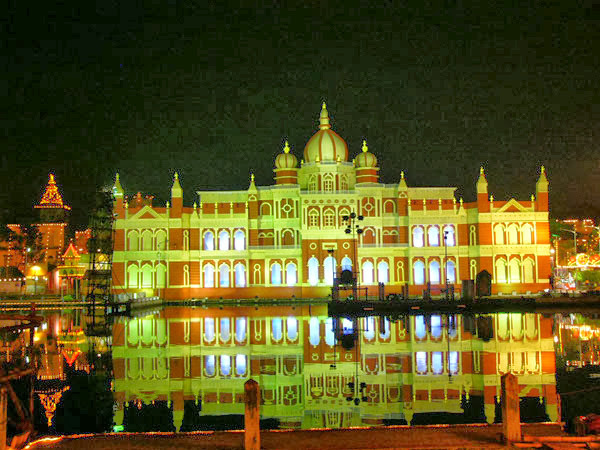 I never felt like that I was living in India when I was staying in Bengal ...it is truly the City of Joy!!... People over there eat, drink and stay merry. They optimistic and broad minded, They look towards the future and not towards the past. They believe in spreading joy. 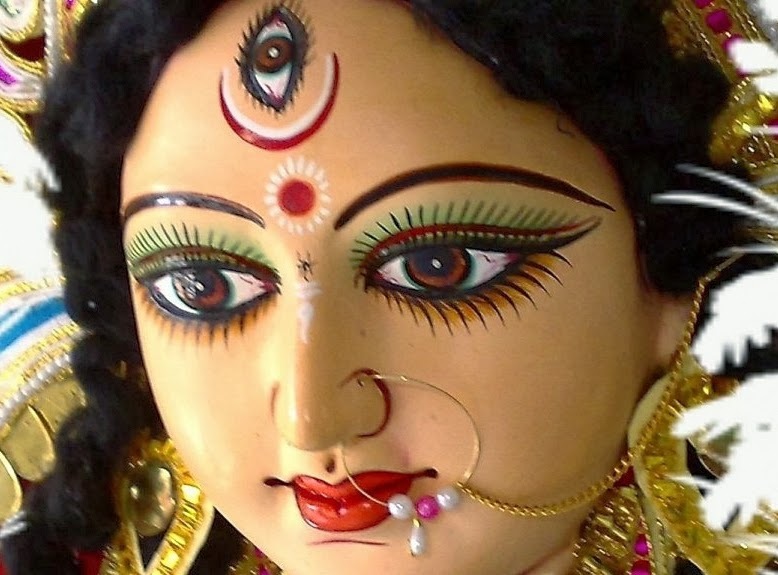 A simple durga puja look. Aishwariya Rai and Madhuri Dixit dancing in Devdas on Durga Puja. Shakha Pola comes in two different colour combinations Black & White and Red & White with 10 gm gold over it. 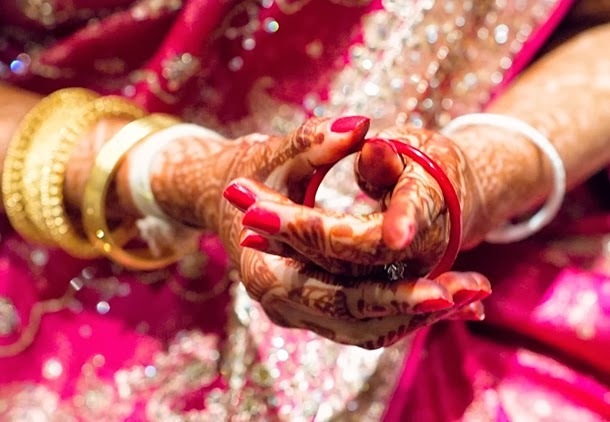 All married ladies in Bengal wear it either on the morning they are to wed or durga ashtami. I purchased Shakha pola for myself from Anjali Jewellers, Kolkata. I wore Chooda along with Shakha Pola. I am wearing my shakha pola's while having dinner at Sonargaon, Taj Bengal. Shanka Pola or Shakha Pola I purchased them from Anjali Jewellers, Kolkata. 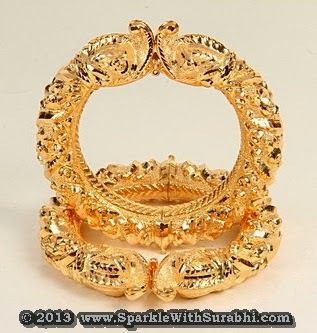 Pair it up with as many gold bangles if you like. 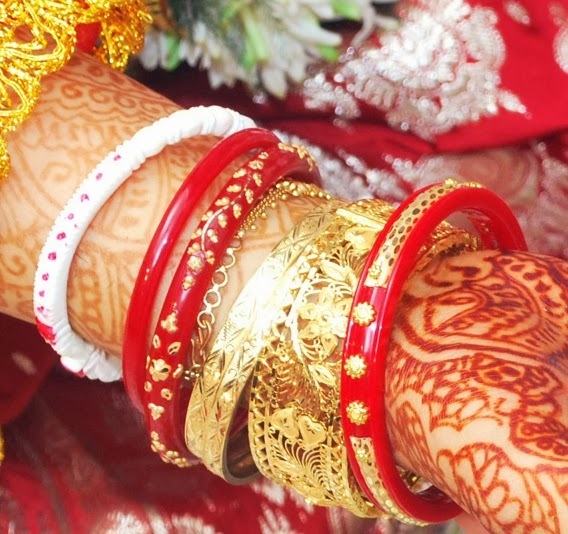 There is another type of Bangle that is pretty famous in Kolkata called "Belpatta - Bala"
Bangles made out of gold carved with vines and leaves or pure gold bangles with carvings like a Bel or Vine. I purchased this Bangle from the Anjali Jewellers, Kolkatta as well and they told that me that even Aishwarya Rai Purchased a pair from them when she got wed. 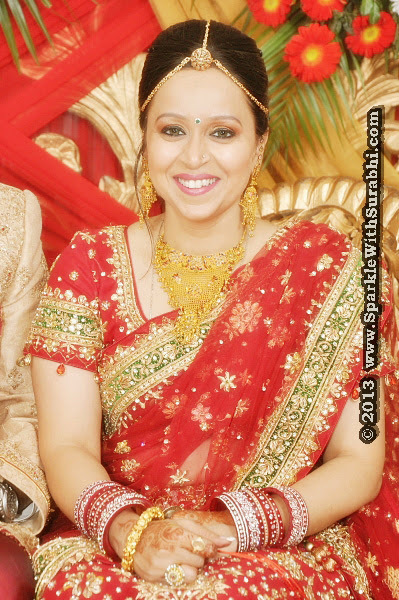 The lehenga that I am wearing is a marwari design which I purchased from Palki Boutique, Kolkata. Belpatta Bala - Bengali Classical Bangle. Belpatta bala a Bengali design to be worn on special occasions such as Weddings. At my brother's wedding in 2012. 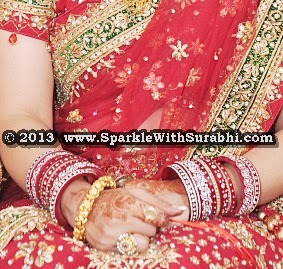 I am wearing Belpatta Bala along with my Chooda's and my wedding lehenga. I am wearing belpaata bala along with my chooda's. Other prominent jewellery designs that Bengali ladies wear during Durga Pooja..
Bipasha Basu as Bengali Bride. Durga Puja in Bengal is a 9 days celebration with huge pandals set up all over bengal. It is not possible for any bengali to visit all durga puja stalls in a week's time. Everything shuts down in bengal - Private and Government offices don't open these days specifically on the 8th and 9th day of durga puja. Nobody goes to work and people everywear gather in huge 10 km's lines to visit durga puja pandals. Sometimes it takes 2 hours just to reach the pandal. Since, my dad was in government service there is different queue for government officers and there families during durga puja in Bengal which made it possible for us to see some of them without any effort. There is actually no traffic on the road as people prefer to walk and that too in queues alongside the roads. There is no pushing around either, they take taxi cabs and leave there cars in the parking lot. Many people keep travelling till 6 am in the morning all over Bengal to visit durga puja pandals..This is how crazy bengali's are about Durga Puja!! There is also a set of Marwaris who live there in bengal who are pure vegetarians and there are marwari or rajasthani stalls set up at every durga puja pandal for them and that is exactly where my family used to visit to have Dal or Besan ke Chile, Halwa, Dal Baati Churma as we used to be off non veg throughout these 9 days OR just have Jal Murri or Puchka's (Bengali Gol Gappe only that they taste different as they use different water flavour, spices and lot of potatoes). 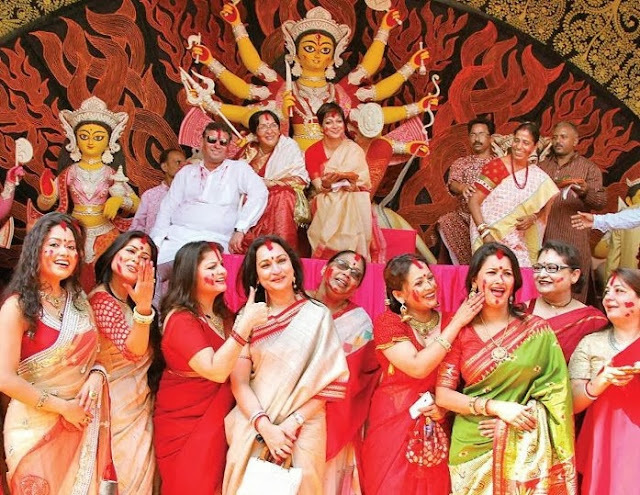 Holi Khela is celebrated before the Visarjan on the 10th day of Durga Puja where all married women play Holi with Sindur or Vermilion or women who are about to get married not only they apply vermillion to each other but also to the idol of Durga for blessings and happy married life! I truly believe that Kali Maa blessed me as I met my husband Anirudh in Kolkata that year and our marriage got fixed soon after. Kali Maa din't let me leave kolkata without playing "Holi Khela" and the most precious find of every women's life is her - life partner!! I remember that I tied a holy thread at Dakshineshwera Temple so that I find my soul mate and the love of my life and few years later my mannat or wish came true. I went back to Dakshineshwera temple after my wedding to untie the thread as my wish came true. Women playing Holi Kheli before submersion of Goddess. 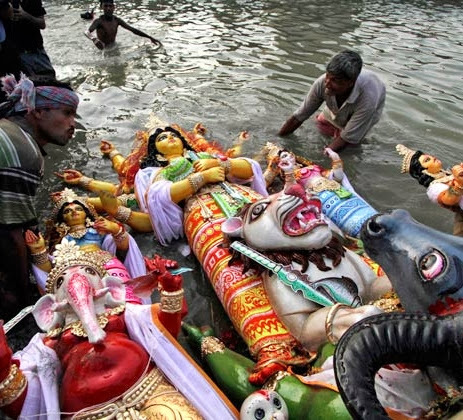 Nowadays, Durga Puja is no longer a foreign culture in Delhi as a lot of Bengali's live in CR Park and they organise puja every year in Delhi for throughout the 9 days. Every year the best Durga puja pandal is awarded by The Times Of India group. So, now there are huge pandals made in all parts of Delhi which has made it very difficult to visit them all in one day. The biggest pandals are made in S.D.A. & C.R. Park and a crazy crowd of lakhs shows up from every part of delhi to enjoy it...since, now I am married into a punjabi family I am allowed to eat non veg on durga ashtami and that is exactly what we do... binge out on mughlai paratha's and chicken biryani :) which I could not enjoy earlier!! 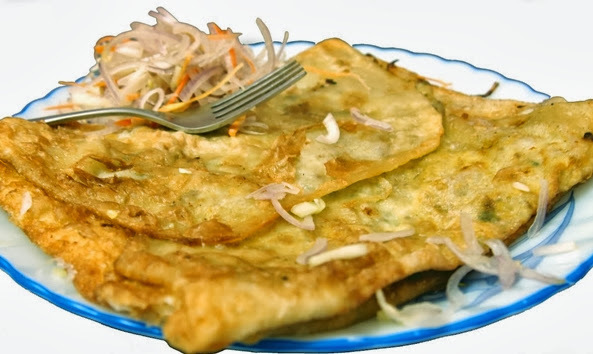 I am right now eating only shudh shakari food/pure veg , I will be also fasting on saptami (7th Day of Navratra and I will enjoy I vrat thalis as well) and I am eagerly waiting for durga ashtami to enjoy durga puja that is also the day I will be wearing my shaka pola's again and have a bite or two of the Mughlai paratha (Fried Bread wrapped with Eggs and Chicken filling inside). 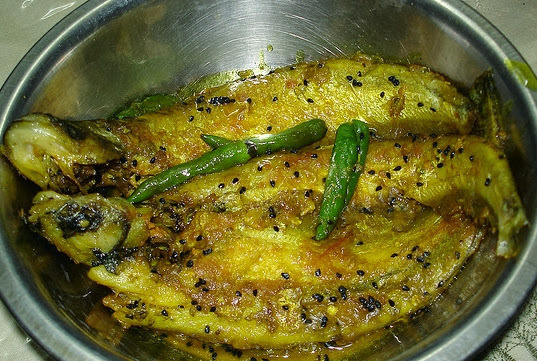 I still enjoy eating Illish Mach or Hilsa in Mustard Sauce, Bhapa Illish (Steamed Hilsa Fish) and Puchka's. 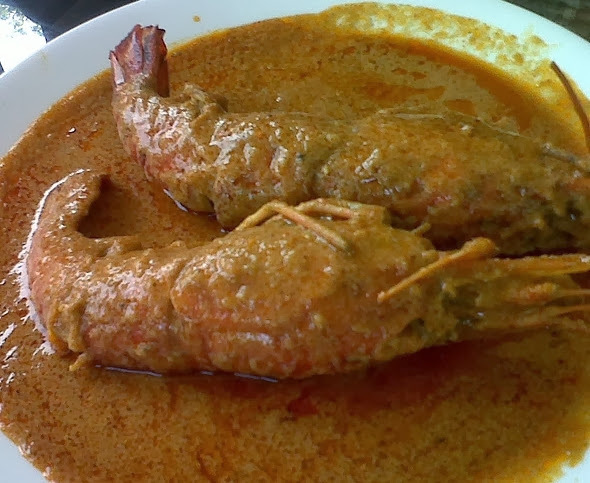 There are other famous Bengali dishes like Kankra Jhal (Crab Curry with coconut), Chingari Malai Kadhi (Lobsters in cream sauce), Pabda Macher Jhal (Pabda fish in tomato or mustard curry) and sweets like Rossogulla's, Mishti Doi & Sondesh. So, I am kind of Benjabi now (Bengali + Punjabi). 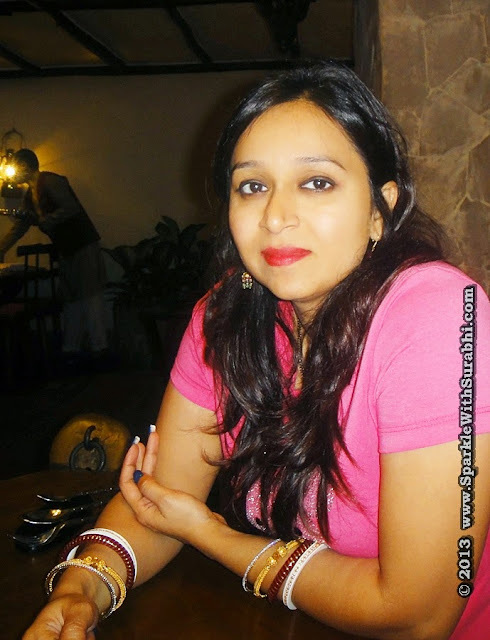 Ram, Ram It's Navratra's and I am thinking of Illish Mach and Mughlai Paratha there are pros and cons of being one... lol!! 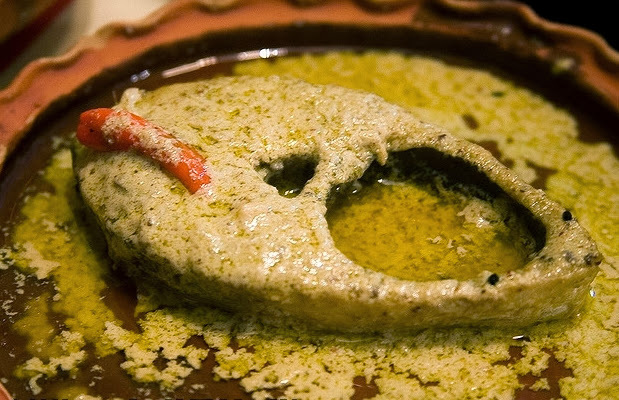 Hilsa Fish in Mustard Sauce - This dish is high in Omega 3 and Mustard Oil is good for skin and hair. 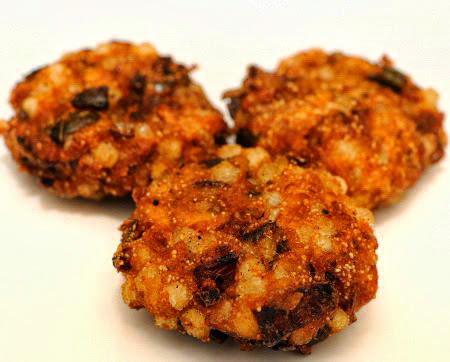 Pabda Macher Jhal - high in omega3 fatty acids. 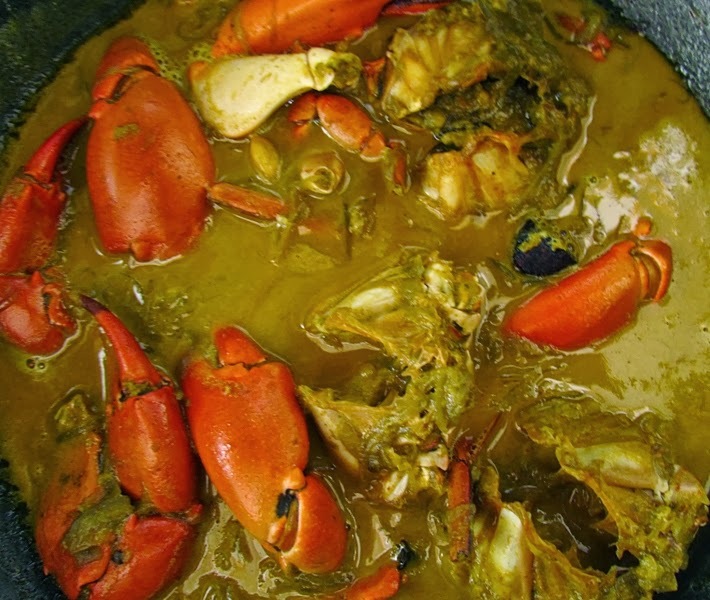 Kankara Jhal - Crab Curry with Coconut. 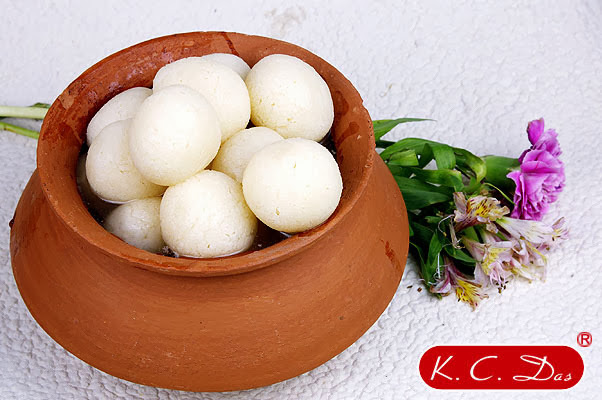 K.C Das Rossogulla - They are good for your Liver. 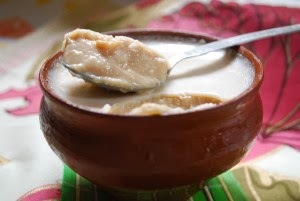 Mishti Doi - It's a probiotic made with gudh or jaggery. Rose Sondesh is made with milk products and rose flavour. 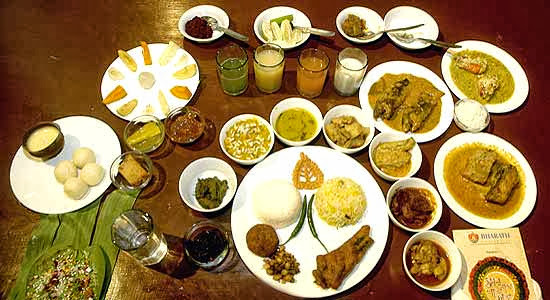 All I have to say that if you really want to enjoy Durga Puja make sure you a take a bite a two out Bengali cuisine at first you might not like it but the taste develops over a period time. The first time I had Hilsa in Mustard Sauce I didn't like but today I would love to have it on the weekends. 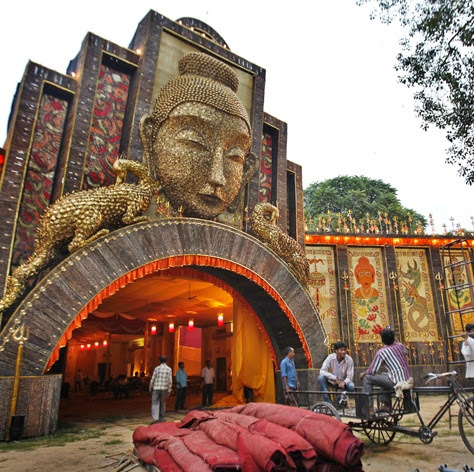 A Durga Puja pandal made in Delhi this year is worth One Crore. Durga Puja Pandal in Kolkatta, West Bengal. Beauty Must Haves: Make sure that you atleast one Bengal Silk Saree in your wardrobe and pair of Shanka Pola in your jewellery collection they actually add lot of charm to any outfit above all they are pretty okay to wear everday as they have only 10gm gold on them or you can even wear them without gold or pair them up with gold bangles! I will be visiting the S.D.A Durga puja pandal this year as well and I hope you have a very happy Navratra's and Durga Pujo ! !